"You are the judge and executioner of Kyros’ law, acting under the watchful eye of the Overlords Archon of Justice, Tunon the Adjudicator. Your words shape the lives of thousands. Will you use that power to bring justice and inspire loyalty? Or will you bring fear and cruelty to the beaten people of the Tiers?" 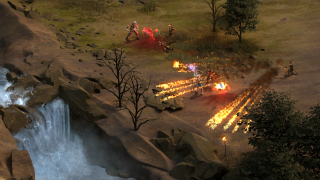 As you can see from the screenshots below, Tyranny has a very Pillars of Eternity look to it. We've seen a bit of the game at GDC and we'll have some harder details to share next week, once an embargo lifts on further coverage. We don't have a release date yet, but we're told it will be out this year. You can visit the official website here.